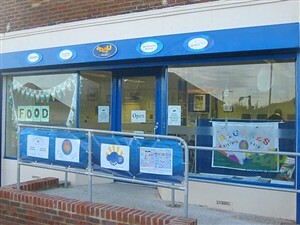 What a day was had by all at our opening ceremony at the Manor Hill Shop! Sue had a dream - and this was the day it came true! 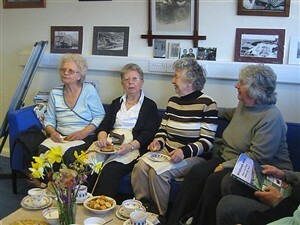 The shop finally opened with a tea party on Wednesday 29 March. A tremendous effort, by quite a few people, had been put in to get this day off the ground. 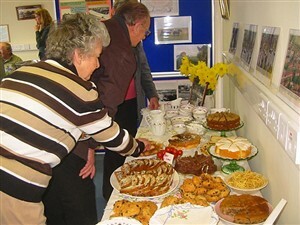 We had the DIY brigade fixing up picture rail to accommodate the numerous pictures and photographs, the cake crowd supplying us with an array of tempting plates overflowing with sponge and fruit goodies, a continuous supply of tea makers and washer uppers plus the flower pickers and table cloth ironers! Sue, of course, insisted on proper linen for the table, napkins and clever little doylies. Beautiful china teasets graced the table making it a lovely traditional event. Everyone enjoyed viewing our substantial and rapidly growing collection of images, many framed and hung specially for the day. 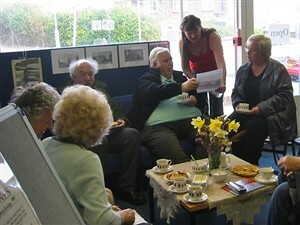 We also had albums, newspaper cuttings and parish registers from our members on show. These all created quite a lot of interest and more questions that need research! There must have been 30 people there and we might get round to making a list one of these days. This page was added on 31/03/2006.